What can temporary architecture do? What can it achieve in comparison with static architecture? These were two of the key questions explored in a brief ‘temporary’ symposium held at the Atelier Bow Wow designed pavilion on its penultimate day in residence in Berlin last Saturday evening. The structure, a substantial yet light-weight carbon fibre framework containing media equipment, mysterious wooden boxes, and quaint multi-coloured chairs for the participants, coped pretty well with the intermittent thunderstorms that cooled the summer heat and threatened those who did not arrive on time for the punctual German start right on the dot. It hardly looks temporary or mobile, built onto foundations laid beneath the stone courtyard, but it will disassembled next week and shipped to Mumbai for its next incarnation – and indeed much of the equipment it utilises is locally sourced so only some loose fittings and the main structure travel, it’s strong bones making it resistant to damage on its future journeys. Guggenheim had pulled together some excellent speakers for the event and there was a real international feel with Juergen Mayer and Lena Kleinheinz from Germany, Peter Fattinger from Austria, myself from the UK and Teddy Cruz who although based in San Diego seems to straddle the city’s border with Mexico in his interests. Everyone talked about buildings and spaces and people – a wonderful commonality that is sometimes missing from architecture events were the design of objects can prevail…. I was lucky enough to get things going talking about architecture in motion – describing past and current changing, ephemeral architectural forms – and could then sit back and enjoy the rest of the presentations. Mayer’s recent wonderful wooden Metropolitan Parasol in Seville is not intended to be a temporary structure at all, but what it does allow is the free use of the place it identifies and the inhabitants of the city do just that in many different temporary ways – adopting and adapting the space to their own requirements, sometimes officially, usually intuitively and often revolutionary. This great building has created a space that people will adopt and enliven long into the future. 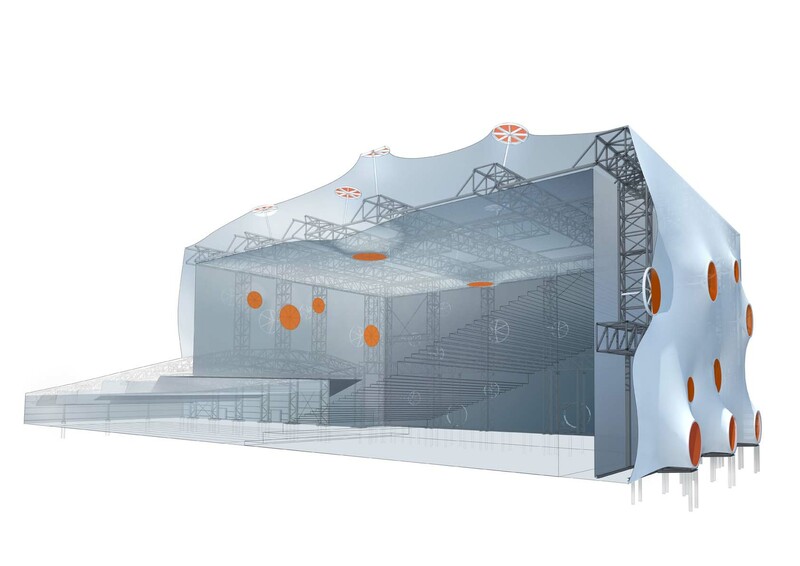 Right on cue Lina Kleinholz of Magma Architecture’s shooting pavilion at the London Olympic Games had produced its first Olympic medal that day. Designed for just a few weeks use in a field in central London, this building had allowed the contestants to be a part of the Games for the first time. Instead of being based in some remote existing shooting range their event takes place in a dedicated facility relatively handy for potential audiences. Evocative and playful it has already inspired other sporting event organisers to try and hire it for forthcoming games in Glasgow and Canada. Peter Fattinger’s community based temporary structures exist for weeks or months on adopted sites in which buildings would not normally be allowed to be built. Built to low budgets often with voluntary or student help, they become a focus for local participants to engage with issues and each other. As usual with successful temporary architecture people want them to become permanent when their time is up. The artificial organisation of land and space by human beings that generate both opportunities and problems is at the heart of Teddy Cruz’ work on the border region of San Diego/Tijuana. The complex problems he is concerned with investigate both the ingenious recycled built structures that arise from economic necessity and the legislative practices that have unpredictable consequences. Staging temporary events with ‘official’ border crossings in unusual locations draw attention to difficult issues of concern to communities on both side of the line. 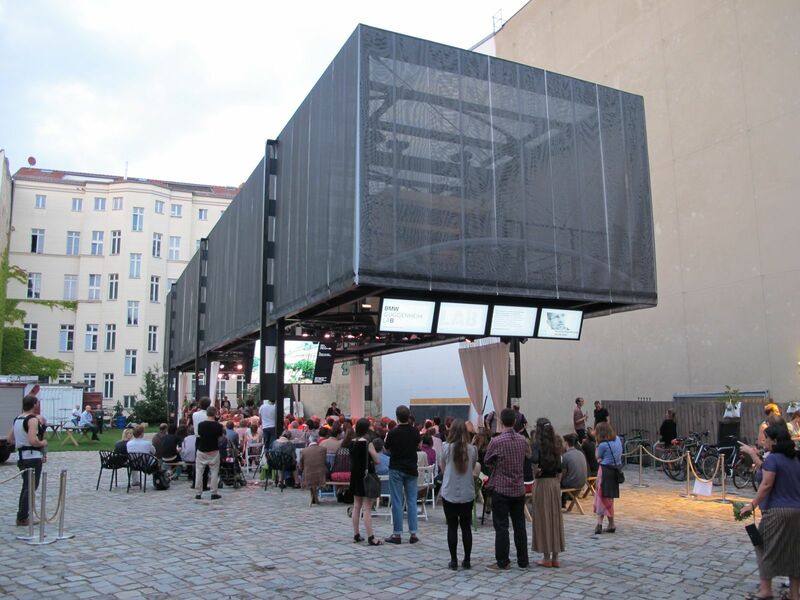 The presentations at the BMW Guggenheim LAB drew attention to the fact that temporary can mean many things in terms of events and structures – time, as Cruz noted, is also a material and depending on how it is used it leads to different effects in different places. In fact the architecture we build in a place, to create a space, determines how time is viewed by the users, who then intuitively engage with it and recognise its possibilities. This applies regardless of function, although places to gather and do things outside the normal run of our lives are particularly energising and important. I had begun the evening talking about the range of temporary architecture that exists and how it has always been a critical part of human activity. I am certain that this will continue, but what this evening’s presentations and subsequent audience discussion reinforced was that the form of temporary architecture is becoming increasingly sophisticated and varied. Clients who would in the past have resorted to standard solutions are now willing to commission exciting alternative proposals that have the potential to bring more from the situation. There was much discussion regarding the possibility that temporary architecture can be subversive and what this might actually mean – if it means subverting people’s preconceptions about the limitations of what architecture can do, and thereby increasing its possibilities, well that’s a good thing isn’t it?